Reading Telescope Standard: College pattern, focusing from one meter to infinity, provided with class optical combination and brass C.P. Fittings, on nicely duco painted round cast iron base with leveling screws, complete with perspex scale. Reading Telescope Standard: Same as 850 provided with up and down motion & eye piece with cross line graticule, improved design for better performance and durability. 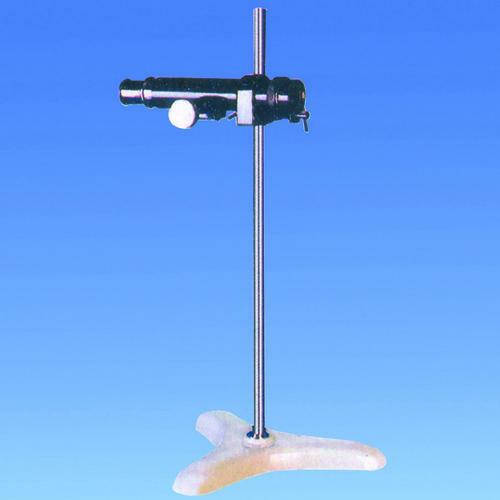 Reading Telescope Deluxe: Fitted on nicely duco painted round cast iron heavy base with leveling screws. The telescope is provided with high class optical combination and brass C.P. Fittings with up and down, to and fro motion complete with perspex scale and Ramsden eye piece with cross line graticule for better performance and durability. Since our inception almost 3 decades ago, we have successful established ourselves as a prominent and trusted organization exporting and trading quality scientific-instruments such as microscopes & various lab apparatus. Demand for laboratory and scientific supplies is tied to downstream industries like pharmaceuticals and biotechnology. We have a strong customer base from these industries, who demand us these equipments in wholesale for supplying to other units. We make sure we export and supply to our customers with the best and scientifically-verified equipments, as we won't want to risk their investment and trust in us. With the help of our technical team, their professionalism and expertise has helped us to keep a strict check on the quality and accuracy of the products we trade in. Scientific equipments are expected to be meticulously accurate in dimension and structure, if they ain't then one cannot carry out experiments successfully. We make sure we help out in carrying out successful scientific experiments and operations.